NOTE: In this centralized page, I have compiled the entire math growth trends of the USA for the past 10-15-20-25 years in terms of the USA nationally (in international settings), all USA states, big city districts of all DoEs as well as the charter growths compared to the districts, and finally the star CMOs. To demonstrate the visual math impact comparisons, I put the yellow arrows for the MMU1 impacts compared to all the rest. To see is to make your belief easier; so I compiled the projected comparisons of the MMU 0.5-2/3-1 vs. the traditional districts, big cities, states, and the USA in terms of the percentile increases, Standard Deviation (STDEV) increases of math in various manner. For the relevant cateogries, you can click. 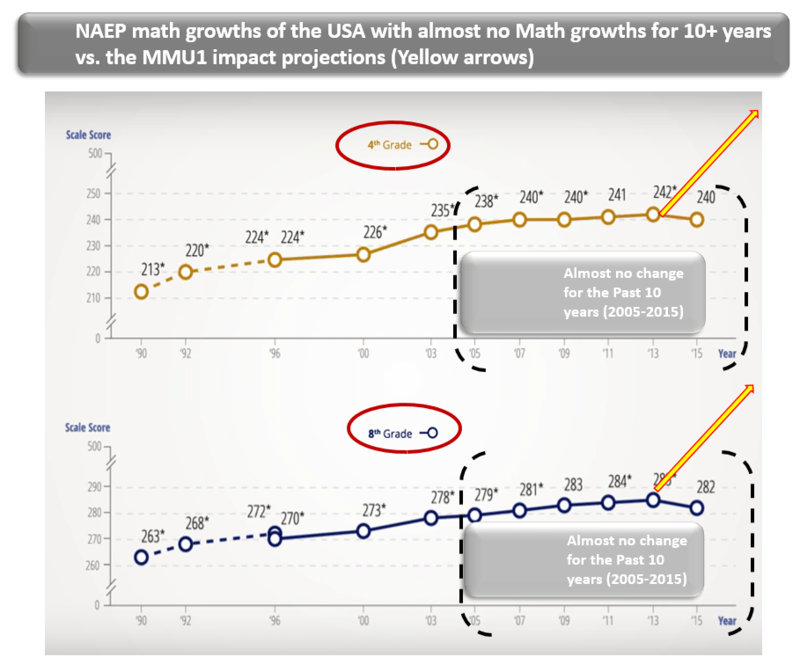 Firstly, let’s look at the math growth trajectories of all 50 USA states (according to the NAEP 1992-2015). To see is to believe. 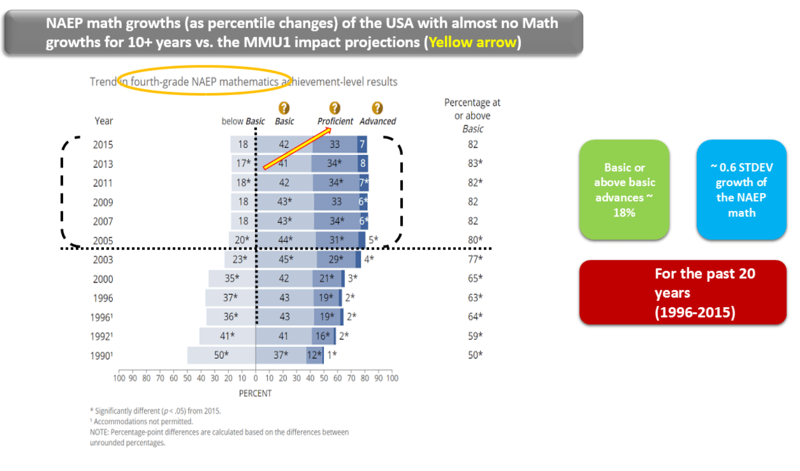 In this page, we added the MMU1 impact projections compared to the USA school math stagnations prominent for the past at least 10 years. For the similar comparisons at the levels of the districts, big city districts, states, charters and CMOs (Charter Mamanagement Organization) Networks, check out the links below. The math growth party time is over. Past 12+ years of math growth stagnations to most of the USA big city districts’ visual trends (and the largest leapers have already lost the steams). Once we have seen the math growth stagnations, let’s see what MMU series can bring as the math stagnations in the current level operations of both of the districts and charter movements (including the start CMOs that have had hard time to scale up inter-states) have limits to change much radically fast. (District & charter levels): MMU1 impacts on the traditional school districts or high charter-share districts. A glimpse to overcome the (math) teacher crisis with MMU series proposals with a chart that show the absurdity of focusing mostly on (math) teacher shortages instead of focusing on the math teacher efficiency boosts or even better, with MMU series. (USA state DoE levels): Math Education stagnations across 90%+ USA state DoEs and the MMU1 math impact comparisons to all states. How MMU x.x series can help rapidly overcoming the feuds between the school districts and charter (networks). And if you haven’t noticed, this is the modern tribal feuds that ended the lives of Romeo and Juliet thanks to the Capulets and the Montague mentality. MMU1 impacts on the USA as a nation as a whole. What Lee proposes with the MMU series to districts and the state DoEs? What data and evidences justify the claims of the MMU variations? Our evidences can be reached from the following links.